Thanks so much to Melody from Melody's Reading Corner for this great award: "This award is for bloggers who distinguish themselves for showing cultural values, ethics, great and fun writing skills, as well individual values, through their creative writing . 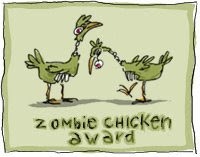 . . "
Thanks to Amy from Passages to the Past for the Uber-cool Zombie Chicken award. EDIT: Thanks too to Smash at Great Books and Fresh Coffee! Thanks to Sandy from You've Gotta Read This! 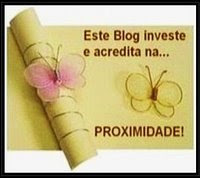 for the Proximidade Award: "This blog invests and believes in the Proximity - nearness in space, time and relationships. These blogs are exceedingly charming. These kind bloggers aim to find and be friends. They are not interested in prizes or self-aggrandizement! . . ."
Thanks to Alyce from At Home with Books for the Lemonade Award given to blogs that show great attitude and/or gratitude! Passing these awards along to all my readers. 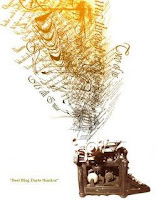 Be sure to visit these four blogs and take a look around -- they are all among my favorites. You do rake them in! And you deserve it. Congratulations! You deserve all the awards you get! Wow! Congrats on all your awards!!! Thank you for creating such an interesting blog!